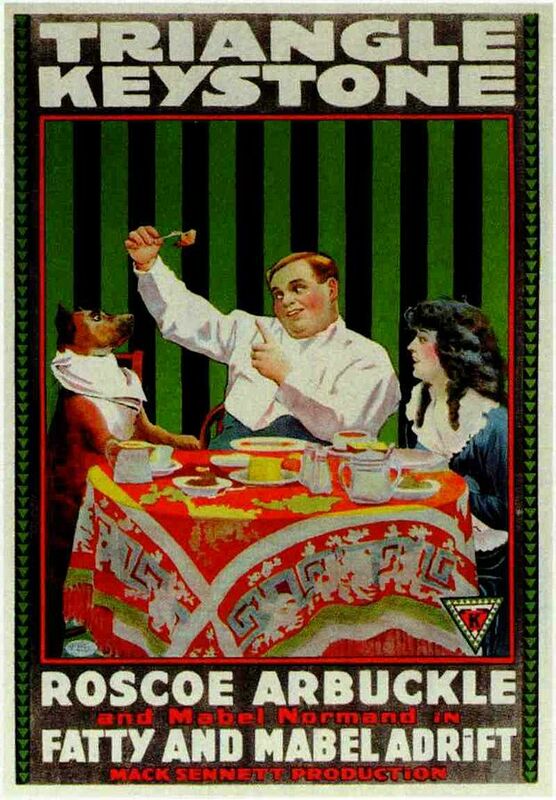 My silent movie pick for January is Fatty and Mabel Adrift (1916), starring Roscoe "Fatty" Arbuckle, Mabel Normand, and Luke the dog. 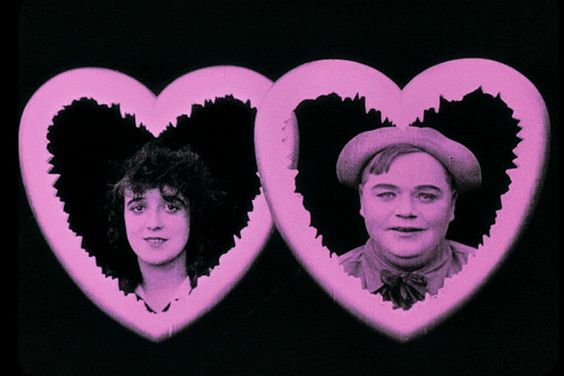 Today, the names of Roscoe "Fatty" Arbuckle and Mabel Normand are often associated with the many scandals that plagued the silent film industry. However, Arbuckle and Normand were both innovative comedians who made hundreds of delightful films together. One of their best is the 1916 short, Fatty and Mabel Adrift, which is airing Sunday (Jan. 15) on TCM as part of the network's Silent Sunday Nights program FYI: All of the other movies mentioned in this article are also airing on Sunday night. Fatty and Mabel Adrift tells the story of two innocent young people (Arbuckle and Normand) who fall in love. For a wedding gift, Mabel's doting parents give the newlyweds and their loyal canine (Luke the dog) a seaside cottage sold by real estate agent I. Landem (Glen Cavender). All is peace and harmony until Fatty's rival for Mabel's affections (Al St. John), decides to get revenge by playing a nasty prank on the couple. Fatty and Mabel Adrift was one of the dozens of comedy shorts Arbuckle and Normand made for Keystone Studios, which was owned and operated by pioneering impresario (and Normand's on-again, off-again boyfriend) Mack Sennett. Sennett had drifted into films after an unsuccessful attempt to become a Broadway actor, and he and Normand met while they were both working at Biograph Studios. While most Biograph directors didn't know what to do with Normand -- unlike most early movie actresses, she had never appeared in the theater -- Sennett immediately noticed her comic talent and brought her along with him to California when he founded Keystone. He cast her in a series of comic shorts like The Water Nymph aka The Diving Girl (1912), which is a fun little film in which Mabel shows off her natural athletic prowess by performing a series of swan dives in turn-of-the-century bathing gear (she is covered from head to toe in a black leotard). 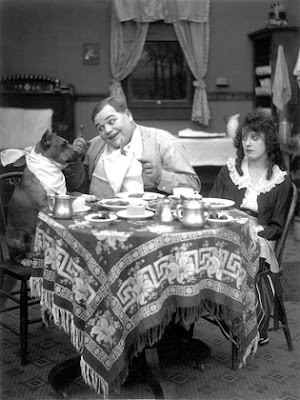 Luke the dog, Roscoe "Fatty" Arbuckle and Mabel Normand in a still from Fatty and Mabel Adrift (1916). Mabel found great success alongside the Keystone Kops (The Bangville Police) and Charlie Chaplin (Mabel's Married Life) and became a solo star in innovative shorts like Mabel's Dramatic Career (1913), in which she plays a milkmaid who becomes a movie star; in a case of life imitating art her former boyfriend (played by Sennett) is gobsmacked to see her on the silver screen. 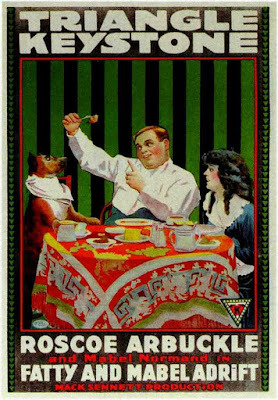 Despite the likes of Chaplin and Sennett, Mabel's greatest screen partner was Arbuckle. He and his wife, Minta Durfee, were minor vaudevillians when he began working at Keystone for some extra cash. At first, he got small parts -- he plays a frustrated theater patron in Mabel's Dramatic Career -- but, eventually, thanks to Mabel's intervention, he began getting substantial parts in shorts like the marital comedy, He Did and He Didn't (1916). 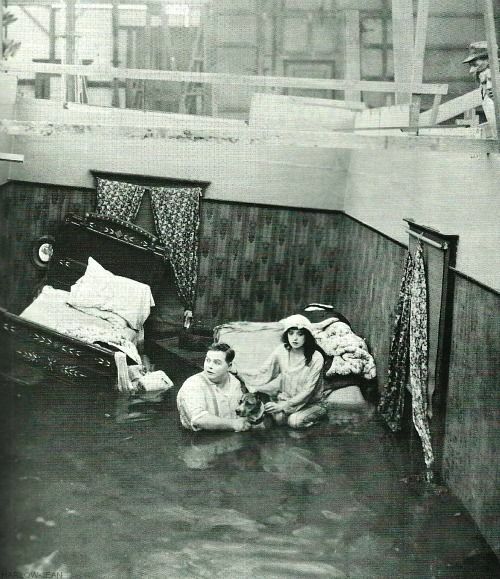 Mabel Normand and Roscoe "Fatty" Arbuckle in the innovative opening scene of Mabel and Fatty Adrift (1916). Sennett teamed the two stars in a series of "Fatty and Mabel" movies that were very popular with aughties audiences. The best of these shorts is Fatty and Mabel Adrift, which was directed by Arbuckle himself with a touch of innocent whimsy. The movie does have a lot of Keystone's trademark slapstick: There's a dastardly villain, bungling cops, and creaky jokes about Mabel's cooking, but there is a lot of sweet and unexpected humor, starting with a lovely opening sequence of Mabel and Fatty framed by hearts. The couple's idyllic home life results in a beautiful scene of Fatty and Luke fishing at sunset and even the inevitable burglars are handled with wit. Wayland Trask, who plays a character named Brutus Bombastic, chews dynamite, drinks gasoline, and lights his cigars by shooting them. 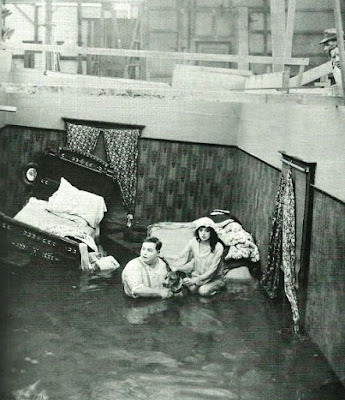 In many ways, Fatty and Mabel Adrift was the high point for both actors' careers. Arbuckle was brought down by allegations that he raped and murdered a young actress at a party in 1921. After three trials, he was acquitted by a jury, but Arbuckle would never again regain the stature he once had in Hollywood. Mabel was tangentially involved in the William Desmond Taylor murder (go here for more), but her real downfall was her hard-parting lifestyle combined with lung problems that eventually led to tuberculosis. Normand died in a TB sanatorium in Monrovia, Calif., at age 37. If you don't want to stay up late to watch Fatty and Mabel Adrift, there's a link below to the full movie.